go for 16:9, it is so much smoother when playing in fullscreen on a 16:9 monitor, and a 16:9 monitor is pretty much a standard household item nowadays. keep the graphics pixely and oldschool but adapt bto modern screen resolution. I too would say go for it! After I drew a few backgrounds for a game I'm currently working on I decided to crop 20 pixels in heigth too. It's not that much of a difference, but really worth it I think. It's nice not to have black borders on the sides. Your game looks really nice btw, keep it up! Would it be possible to keep the back backgrounds as they are, but give the player the choice of whether they wish to see boxes on the borders or to crop the images? Though this would require having to figure some way to get the engine to crop the images for you you and I don't know how difficult that would be to code. Yes, I think that I'm going with the 16:9 aspect. It's more work, but looks more professional in my opinion too. I think it's also easier to desing rooms to 16:9, I've had problems with the room heights, all the action happens in the middle part of the screen, and the top and bottom is usually just dead space. Happy Halloween from Keziah Mason! Watch out or she'll get you! I am completely interested tell me more!! Wanna go for some D&D?? Man, the game looks incredible! The character design, animation, the backgrounds, it all just oozes style and atmosphere. And those flickering reflections in the last image! Thanks! I hope so, it might give you a slight upper hand, but thats only fair. The RPG-elements and other events require also bit of strategizing. Wonder what would happen if you threw a bucket of water on Keziah Mason? It worked in the Wizard of Oz! Though I imagine in this game it would only annoy her and cause her to do something nasty to you. Very stylish. The colors and animations are great! this is getting better and better. Is this an old vinyl record in the top right? Is this an old vinyl record in the top right? You're not the first person saying that... But no, it's not, you will see it in the game when you scroll up to the next stage. I can say that it's more cosmic than a vinyl record. 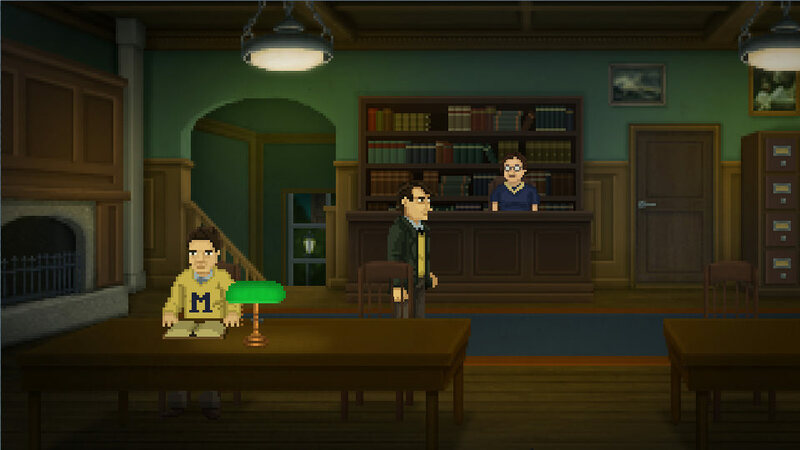 Another screenshot, this time we are inside the Miskatonic University. Still a bit under construction though! this is a place you will be spending quite a lot of time.